Today's defence-related news includes coverage on HMS Dragon who is currently on operations in the Gulf and reporting on Northern Ireland historical investigations. The Telegraph reports from onboard HMS Dragon, who was transiting through the Gulf as part of Exercise Saif Sareea 3, adding that the Royal Navy navigates a delicate diplomatic course through these 'choppy waters'. The report notes that HMS Dragon's twin gas turbine generators alone produce enough energy to power a city the size of Leicester and picks up on comments made by Lt Cdr Richard Attwater who said: "It's a very volatile region. And we're sailing 8,000 tons of Britain right through the middle of it." The Express and the Mirror report on the open letter to the Prime Minister on Northern Ireland historical investigations and feature comments made by the Minister of State for the Armed Forces, Mark Lancaster yesterday at Defence Oral Questions. We are indebted to those who served with great courage and distinction to bring about peace and security in Northern Ireland. That is why I don’t want to see elderly veterans having to face repeated investigations decades after the events in question. The Northern Ireland Office recently closed a consultation on legacy cases like this and will report soon. The Ministry of Defence has put in place a comprehensive package of support, including legal representation to any individual accused of an offence arising from their service on operations. A new team has also been created to consider the concerns of veterans and the wider public in order to find appropriate solutions. 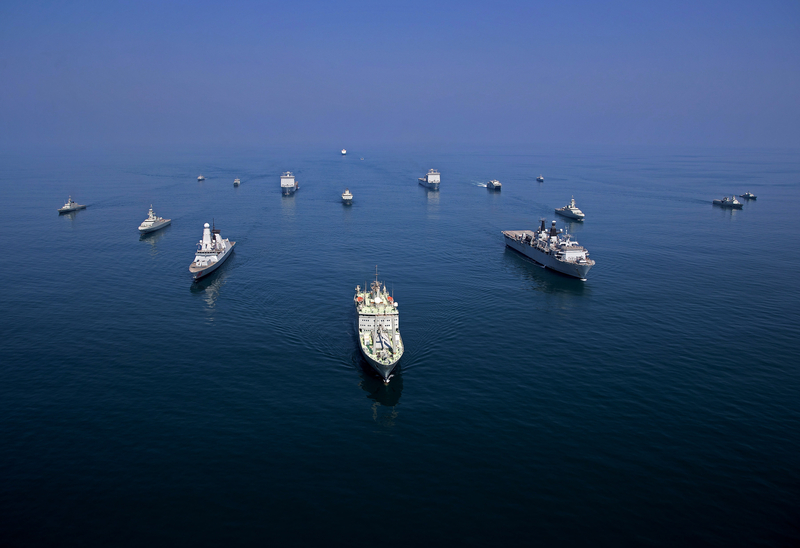 The Saif Saree'a 3 Task group formed up of the Coast of Oman. The 19 Ships included Royal Navy and Omani ships. The ships formed an arrow head formation with the Omani Navy at the front taking lead. On completion they starburst and proceeded to carry on exercise tasking.